February is National Arts Month – National Arts Festival. This yearly celebration is in pursuance of Presidential Proclamation 683 signed by then Philippine President Gloria Macapagal Arroyo. 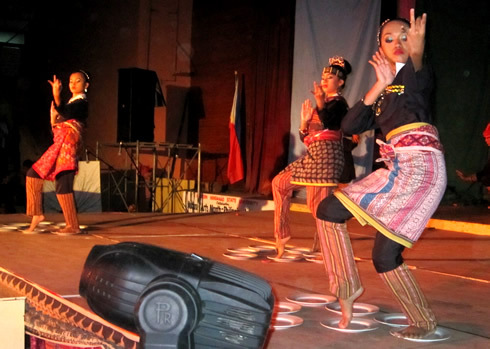 The celebration in the Zamboanga city was spearheaded by Western Mindanao State University, Office of Culture and the Arts (WMSU-OCTA) headed by Dr. Roberto B. Torres, together with the Association of Creative and Performing Artists of Zamboanga, Inc. (ACPAZ), of which he is also the director. This year’s theme is “Ani ng Sining: Celebrating the Harvest of Culture and the Arts”. The event’s main objective is to continue the advocacy for cultural identity; celebrate the talents of Filipinos; and continue the advocacy for Culture and Arts education, Dr. Torres said. On February 1, a grand parade opened the celebration in Zamboanga City which was participated in by contingents from various schools in their colorful costumes, and other art enthusiasts. It was followed by an opening program at the Western Mindanao State University open field. WMSU College of Law Dean, Atty. Eduardo Sanson, speaking in behalf of WMSU President Dr. Grace J. Rebollos, declared that arts spells the difference in life. To this thought, Mr. Al Rahimin Kenoh, Administrative Officer V, Department of Education, Region IX, added saying, “art is an important ingredient in life”. City Administrator Antonio Orendain, Jr. who spoke in behalf of City Mayor Celso Lobregat, underscored the imperative to “love and preserve who we are”, as a people. Highlights of this year’s celebration were a parade contest; a children’s arts camp; a drum and lyre competition; an oratorio; and a dance competition (folk, ethnic, and dance drama). The following won the parade contest: National High School West, Best Choreographed Group; and Zamboanga State College of Marine Sciences and Technology, Best in Traditional Costume. All the contestants of the drum and lyre competition were given the first place. They are from the following schools: National Central School, Catalina Vda. De Jalon Elementary School, Zamboanga West Central School and Zamboanga East Central School. Mr. Al Vincent S. Francisco of WMSU won the Oratorio contest, college level. The dance competition highlighted the closing ceremony of the month-long celebration. The following were the winners of the folk dance competition: Sta. Maria Elementary School, first place; WMSU Integrated Laboratory School Elementary Department , second place; and San Jose Gusu Elementary School, third place. Meanwhile, WMSU-ILS Secondary Department won first place in the ethnic dance contest while Basilan State College High School Department run away with the second place. On the other hand, Southern City Colleges won first place in the dance drama competition, while Comtech Institute settled for the second place.